Say, this is good. Based, somewhat loosely, on Robert Louis Stevenson’s 1888 novel, it compresses and abridges but gets the essence right. 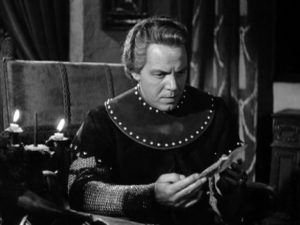 This is another of producer Edward Small’s swashbucklers starring Louis Hayward, a story of the War of the Roses in which Hayward plays one of the victorious Yorkists, Sir Richard Shelton, returning home after the defeat of the Lancastrians. He pauses to drink at a stream, and a black arrow thuds into a tree next to him—an arrow wrapped with a note in rhyme from a mysterious “John Amend-All,” warning him of treachery ahead. And in fact, Shelton arrives at his home estate to find his father has been murdered, a crime blamed on a neighboring Lancastrian noble, now executed—but survived by a spirited daughter, Joanna Sedley (Janet Blair). More black arrows arrive with rhymed warnings and clues, and gradually Richard realizes that there was something fishy about his father’s murder. Interestingly, we know whodunit from the start: Richard’s grasping Uncle Daniel (George Macready), whom we see meeting with his three accomplices to pull the wool over Richard’s eyes. Following the clues of the black arrows leads Richard to a gang of outlaws in nearby Tunstall Forest, a band already deliberately evocative of Robin Hood’s in Stevenson’s novel, the similarities emphasized even more here. The rest of the story is about how Richard, with the help of Joanna and “John Amend-All,” learns the truth—and what he does about it. If the sets look familiar, it’s because we’ve seen them before in Bandit of Sherwood Forest and Prince of Thieves, and will see more of them in The Swordsman and others to come. Hayward’s Sir Richard is one of his best performances, and Macready does good work as the villainous uncle, but Janet Blair as the heroine deserves special notice. Blair, a big-band vocalist who had a second career acting in the movies, is sharp and spicy, and her byplay with Hayward is delightful. Kudos also to Lowell Gilmore, suave and malicious, as the slightly-hunchbacked Duke of Gloucester—yes, the eventual Richard III. And though the film’s budget is modest, veteran director George Douglas keeps the action spare and tight. Douglas made several swashbucklers, and we’re always glad to see his name in the credits; you may know him best as the director of the sci-fi classic Them! (1954).